It's the day before Thanksgiving. Hopefully your menu is set. If you're like me, you may even be busy cooking and prepping some dishes today. Below are links to all of my Thanksgiving recipes and other stories for this year. Marbella-Brined Roast Turkey Breast Spanish flavors of the classic Silver Palate Cookbook recipe Chicken Marbella infuse this wet-brined turkey. Stuffing-Brined Roast Turkey Breast Some people stuff turkeys to flavor the stuffing with the turkey. But what if you instead flavor the turkey with stuffing? Buttery Mashed Potatoes Mashed potatoes seems simple, but there are some techniques involving how you mash and butter the potatoes for optimal texture and flavor. Sausage-Cornbread Stuffing My all-time favorite stuffing recipe handed down from my mother. Butternut Squash, Pecan and Bacon Bread Like pumpkin bread but with butternut squash. Oh, and bacon. Yeah, bacon. Indian-Spiced Nan Bread Stuffing Indian spices flavor this stuffing made with Indian nan bread. Butter-Flaky Biscuits Through folding and rolling, these biscuits have buttery flaky layers. Apple Butter A wonderful fall accompaniment to biscuits and other breads. Deconstructed Sweet Potato Casserole Re-thinking the Thanksgiving classic side to be less sweet and gooey with a stronger focus on good sweet potato flavor. Kale, Smoked Gouda and Pecan Gratin Gratins are awesome because you can get credit for eating a vegetable side, but it's actually an excuse for eating something creamy and cheesy. Green Bean Salad with Almonds and Quinoa A truly healthful side dish to help balance all these other rich holiday dishes. Sweet Potatoes with Mole and Queso Fresco A simple side of roasted sweet potatoes with spicy Mexican mole sauce and cheese. Roasted Brussels Sprouts with Pecans and Honey-Curry Yogurt Another Indian-inspired dish, a simple affair of roasted sprouts and pecans with yogurt mixed with honey and curry powder. Caramel Apple Custard Pie Another look at the apple custard pie--a nice compromise between a pumpkin pie and an apple pie--this time with a graham-cracker-coated crust and caramel sauce. Cocktail: A Sage Old Bourbon This whiskey and sherry cocktail, with flavors of cranberry, celery and sage, is inspired by the savory flavors of a Thanksgiving dinner. 8-2-Eat: Affordable Thanksgiving Wines Splurging on a Thanksgiving wine is certainly a fine thing to do, but if you're throwing a big dinner and need lots of bottles, it might help your wallet to reign things in a bit. These suggestions are all under $20. 8-2-Eat: Thanksgiving Cocktails Ideas for drinks to serve before, with or after the big meal. 8-2-Eat: Vegetable Sides It's easy to load up on carb-heavy dishes. Don't forget to serve some vegetables too. Overview A look at this year's recipe themes. Thanksgiving Central Still need more recipes? 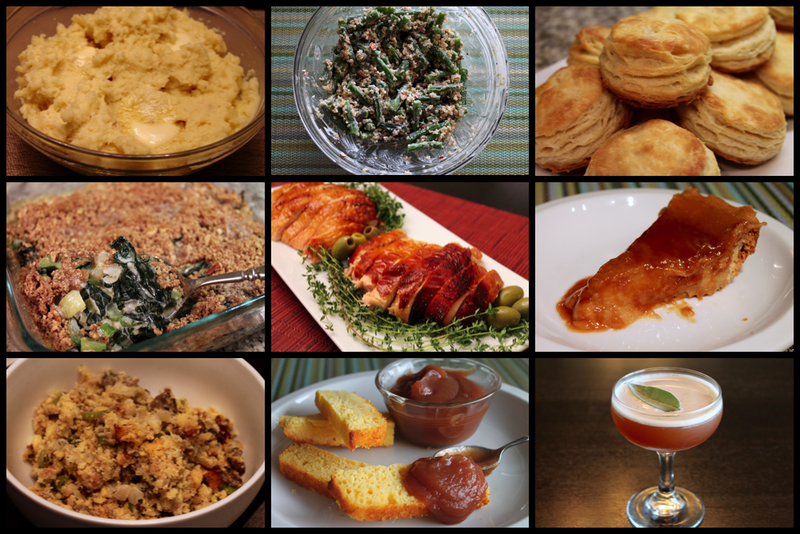 Here is the collection of my Thanksgiving recipes from years prior.